Dubai, UAE, March 28, 2018: Following extensive research at the FOREO Institute, the world’s biggest beauty tech brand, FOREO, has just launched an innovative, highly charged, smart life coach in the form of a toothbrush, the ISSALEXA. Not only will the T-sonic electric toothbrush provide the very best in dental care, but what makes it especially advanced is its in built ‘lifestyle’ support intelligence’ that will advise and speak to its owner, by analysing saliva, thus allowing it to know what emotional and life support you need for the day, or before going to bed. The research and development team at the institute held clinical trials with over 100 people, over a five month period where it found that the mouth is the window to the body and by analysing saliva, they could determine a human’s lifestyle requirements. Combining this research with FOREO’s exemplary innovation in technology, the brand has created the ISSALEXA which uses speech technology and artificial intelligence to emotionally and smartly support its owner when saliva detects abnormalities. For example; Nerves, anxiousness and stress; findings from the research showed when people are displaying stress, anxiety and nerves, the mouth becomes abnormally dry (known as Xerostomia). ISSALEXA can detect and offer words of encouragement such as ‘Take it easy today John. You work to live, not live to work’ and ‘Remember to chill today Brian. Life is what you make it’. Emotionally Sensitive; When saliva was analysed, it found that people were emotionally sensitive when there appeared to be an imbalance of the stress hormone, Cortisol. When detected, the ISSALEXA will tell you, ‘Chin Up Beautiful - things aren’t that bad’, or ‘Always look to yourself for guidance Jane’. Faithfulness; An add on option for users includes the detection of rogue saliva in one’s mouth - meaning partners can use it to tell if their partner has been kissing somebody else. The technology eliminates the users saliva and picks up particles from alien saliva where it will go into warning mode, flashing red and offering ‘Who’s been a naughty boy / girl’ commentary. Health warnings; Pre-programmed with your brushing routine, the ISSALEXA’s intelligence will determine if you have skipped your oral regime and forgot to brush your teeth after a night out. When sensors detect nightfall and lack of movement and energy in the house, the ISSALEXA will shout from the bathroom, ‘Alcohol enhances bad breath so I’ve cancelled your drinks with friends tomorrow’. Part of the revolutionary ISSA range, this is not the first time FOREO’S iconic toothbrush has been in the headlines. Last year, the second generation ISSA 2 was featured onboard the Star Trek Discovery set in the year 2364. It was positioned as the toothbrush of the future then, but it is certainly the toothbrush of the future now. ! You can personalise your very own ISSALEXA online at foreo.com by keying in the unique product number and registering your name so your device can be activated via remote technology. 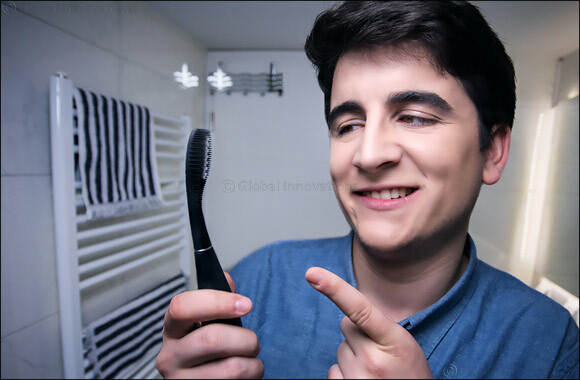 Those looking for a more personalised toothbrush can take the short questionnairewhich will also be programmed and enhance the intelligence of your very own ISSALEXA as well as syncing your calendar so the ISSALEXA knows your social plans. The ISSALEXA is available now at www.foreo.com, priced at $299 and will come in black and cobalt blue for men, and enchanted violet and summer sky for women.